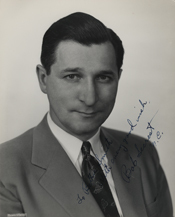 SECREST, Robert Thompson, a Representative from Ohio; born on a farm near Senecaville, Noble County, Ohio, January 22, 1904; attended the public schools; graduated from Muskingum College, New Concord, Ohio, 1926; graduated from Washington, D.C., College of Law, 1938; graduated from Columbia University, New York, N.Y., 1943; graduated from British School of Civil Affairs, Wimbledon, England, 1943; school administrator; superintendent of schools of Murray City, Ohio, 1931-1932; member of the Ohio state house of representatives, 1931-1932; elected as a Democrat to the Seventy-third and to the four succeeding Congresses and served until his resignation on August 3, 1942 (March 4, 1933-August 3, 1942); United States Navy and later promoted to commander and served until February 28, 1946, in England, Africa, Italy, and the Pacific as military government officer; unsuccessful candidate for election to the Eightieth Congress in 1946; legal supervisor, Library of Congress, 1946-1947; elected as a Democrat to the Eighty-first and to the two succeeding Congresses and served until his resignation September 26, 1954 (January 3, 1949-September 26, 1954); had been renominated in the primary election May 4, 1954, to the Eighty-fourth Congress; member of Federal Trade Commission, 1954-1961; director of commerce, State of Ohio, 1962; elected to the Eighty-eighth and to the succeeding Congress and served until his resignation on December 30, 1966 (January 3, 1963-December 30, 1966); unsuccessful candidate for reelection to the Ninetieth Congress in 1966; member, Ohio State senate, 1969-1973; member, national council, American Legion, 1978-1987; died on May 15, 1994, in Cambridge, Ohio; interment in Senecaville Cemetery, Senecaville, Ohio. Papers: In the George White Papers 1914-1953, 67 cubic feet. Other authors include Robert Thompson Secrest. Papers: In the Donald Marquand Dozer Papers, 1893-1981, 145 boxes. Correspondents include Robert T. Secrest. Papers: In the Sam Rayburn Papers, ca. 1831-2007, approximately 119 feet. Correspondents include Robert T. Secrest.